HOUSTON (ICIS)--US August polyethylene (PE) contracts were assessed 3 cents/lb ($66/tonne) lower for most grades based on lengthening supply. Prices for high density polyethylene (HDPE) injection grade were assessed 6 cents/lb lower as additional discounts were seen for this grade as spot prices for HDPE injection have been trading at a discount to other grades of HDPE for the past several months. PE plants have been running at healthy rates, with few major plant issues being seen over the past month. Inventory levels have been rising in recent months as most plants have been running well following a series of plant issues during the first quarter, while increased US production from new plants has also contributed to a rise in PE supply. A slump in overseas demand stemming from a strong dollar as well as disruptions in US exports to China following China’s implementation of additional duties on US PE have also increased availability for the domestic market. 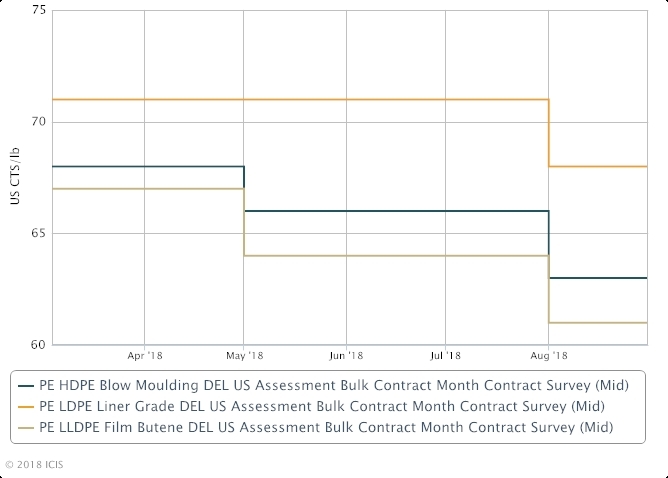 ICIS assessed August contracts for linear low density polyethylene (LLDPE) butene film at 58-64 cents/lb, high density polyethylene (HDPE) blow moulding at 61-65 cents/lb and low density polyethylene (LDPE) liner grade at 66-70 cents/lb, all on a delivered US in bulk basis. Major US producers of PE include Chevron Phillips Chemical (CP Chem), DowDuPont, LyondellBasell, ExxonMobil, Formosa, INEOS, Total Petrochemicals and Westlake.